This dome has been placed at 10m by some of our SCUBA friends at the Dolime Quarry. We had a great day at the Quarry with 17 degree surface temperature and thermocline at 12m. We will be starting the regular Tuesday freediving at Dolime Quarry on June 12th at 5pm. You are welcome to dive with us if you are taking the Open Water AIDA 2 or 3 Star courses or you join our Open Water Training. If you are at least AIDA 2 star certified, you can also just come out and dive with the other freedivers. Why am I cutting up my daughters old Tu Tu skirt to Freedive? Canadian freedivers know exactly why I am doing this, don’t worry, my daughter has outgrown the skirt. We dove just North of Parry Sound a few weeks ago, which is in the beginning of black fly season. Because black flies are attracted by CO2, they simply loved to hang out on the top of our snorkels. We are diving again this weekend which will be in the middle of black fly season, which means that I need to be prepared. Even though I am not a vegetarian, there is a limit to the amount of black flies I can eat. I have put together this tutorial showing my high tech solution. You can request detailed design and structural drawings. While freediving is an exercise in relaxation, it’s easy to psyche yourself out on the competition front. There’s rules you have to consider; you might have a case of the jitters that day; you could stumble upon some other inexplicable personal wall. What’s crucial is that you stay relaxed in spite of those things! It’s important to remember that you are freediving for yourself and yourself only and competition is a great place to test yourself and your limits, surrounded by an encouraging and supportive community. When you put your airways below the surface and start your dive, you set out to do your best to come up clean in the end. There have been times when I’ve gone way beyond what I had done in training and come up triumphant and there have been times when I played it safe. There have been times when I didn’t listen to myself and pushed too hard. You do your best and, whatever happens, you should use that as a learning experience. You might surprise yourself in the best way possible. RELAX – first and foremost! Take a deep breath (from your belly up) and let it out, slowly. Do it now, even. Don’t eat anything for at least 2 hours before your dive time, but remember to stay hydrated. I wouldn’t advise doing cardio of High Intensity Interval Training a few days before the comp, but yoga is highly recommended! Be careful not to strain yourself, though. Figure out your warm-up and equipment set-up routines even before you get to the pool. In freediving competition, you must be in sight of the judges an hour before your dive, so use that time to lay out your equipment and warm up on deck. An excellent way to do this, is to write everything down in the order that you’re to do them – write it down to the minute, but PLEASE REMEMBER to give yourself extra time for anything incidental. Making a list/timesheet is a great way to make sure you don’t forget anything you intended to do – or any equipment you might need. You’ll thank yourself later, trust me! For your wetsuit, I would recommend NOT putting it on too early, as you’ll likely overheat, but it’s important to give yourself enough time to tug it on with plenty of time given to relaxing afterwards. Putting on a wetsuit is a workout in and of itself and you need time to ‘cool down’. Everybody’s warm up routine is different, so I won’t preach what’s best, but here’s an example based on what I do: I’ll start with light stretches to loosen up, and follow up with low-to-medium-intensity yoga. Then I will quite literally lie down on my yoga mat, shut my eyes and will my body to relax from the toes up. Talk yourself through each body-part – it helps. Stay relaxed and loose for at least 20 minutes before your dive. 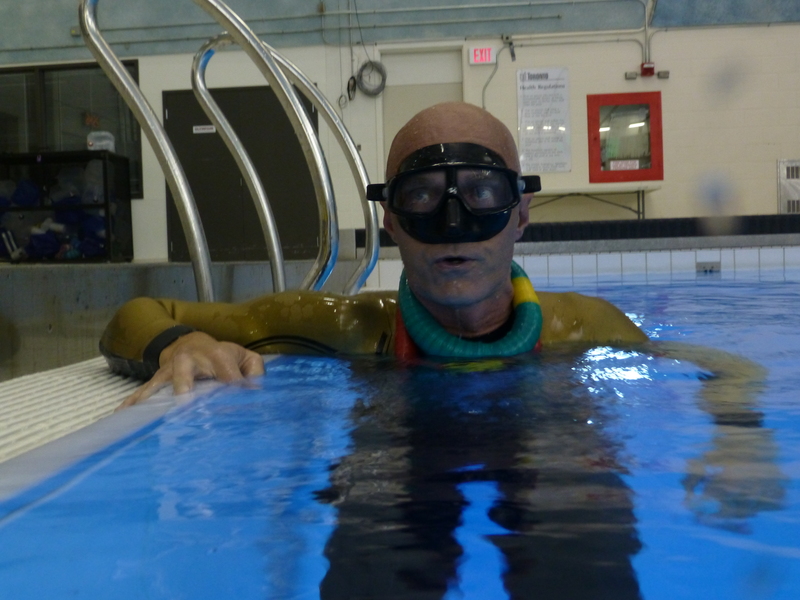 I make sure I am ready to be in the water – suit, facial equipment, fins (if you’re doing that) – about 5 minutes before my dive. That gives me enough time to remember anything I might have forgotten. In the end, competition is a great way to learn something about yourself and find room for improvement. They’re also a lot of fun. Remember to breathe – at least up until your dive time! Freedivers gathering at Morrison Quarry for the 9th annual Freeze Dive. Ice diving is a bit cold, but a great experience. It is an interesting feeling being under the ice. The light coming through the holes and through the ice itself combined with the bubbles under the ice play with your senses. Crawling along under the ice and having a ceiling above you while diving is a great way to test how calm you are while diving. You know it is only 5-10 seconds to the nearest hole, but will your rational mind be in charge. Take a course with us and come out and try ice diving next year. Thanks to our friends at CASM for organizing this great day. We often get asked about neck weights and I recently needed a heavier neck weight so I decided to create this post to show how to make one. Below are two images showing the supplies needed. The bag of lead pellets can be purchased at Bass Pro Shop or most other hunting stores. I bought a 25 lbs bag of very small pellets, but you might be able to find a store that carry smaller bags or maybe a dive shop that carry lead pellets. Bass Pro Shop also has the 1 inch buckles I used for my neck weight. I find 1 inch big enough to open even with cloves on and it isn’t as bulky as some of the larger buckles. The scale, funnel and inner tube was purchased from Canadian Tire and the tape is from Home Depot. Only one color tape is needed, but I just wanted to show all the cool colors available. The length of the bike tube should be the length of your neck circumference plus 20 cm. My neck is 40 cm and I cut off 60 cm of tube, which worked out nicely. The thickness doesn’t matter as much, because the tube will expand, but I did made sure I didn’t buy a racing tire, which is very thin. The inner tube I bought can be used for a range of tire widths, ranging from 1.75″ to 2.125″. There are a few ways of attaching the buckles and I have chosen the simplest solution. I find it has worked well on my last neck weight which has held up great for two years and show no signs of wear and tear. It can be a little difficult to get the tube through the ends of the buckle, but it only took me 5 minutes for the first and 2 minutes for the second buckle. Make sure to do the hardest of the buckles (if they are different) first, because the tube is easier to hold when it is empty. There is a different way of attaching the buckle shown here from another blog: orangellous. The lead pellets are extremely small and hard to control, so make sure to do all the weighing and filling in a big plastic container. You should get some help from an instructor or experienced freediver with determining how much weight you need both with and without a wetsuit. Filling the neck weight would have been hard without a funnel and I also found out that I needed a plunger. I am creating a 5 pound neck weight and all the pellets don’t fit in the tube without stamping them and expanding the tube a bit. I filled up about 10 cm of the bike tube and then used the stick to stamp the pellets. After stamping, the tube will mostly keep the thicker shape and more pellets can be added. I did this in 5 cm increments stamping each time and made sure I had about 15 cm of tube left after adding all the pellets. The plastic clip was very useful when adding the second buckle. I placed the plastic clip tight to the pellets which allowed me to fairly easily add the second buckle and try on the neck weight for size. The size of the neck weight stretched out was about 47 cm, but bent it was only 43 cm and with tape it finally ended up a little over 42 cm inside. The spoon in the picture was used to scoop up a few of the small guys that got away from me. Above is the neck weight before I taped it and before I shaped it. Make sure to spend lots of time shaping it so it will be symmetrical and isn’t too thick in the sides. If you make it too thick in the sides it can be harder to get your arms correctly above your head for streamlining. This is the final look of the neck weight with two layers of tape. I added two layers to make it as strong as possible and make sure none of the little pellets have a chance to get out and so water can’t get in. This is almost identical to my previous neck weight which has been great so far. I will be using it for our freedive practices when I don’t wear a wetsuit. I will be creating a heavier neck weight for when I wear a wetsuit. I hope this will help you make your own, but I will also be posting these neck weights for sale, because several people have said that they prefer to buy them instead of making them. This is such a great video by our friends in Montreal from ApneaCity about a breathhold and deep dive. 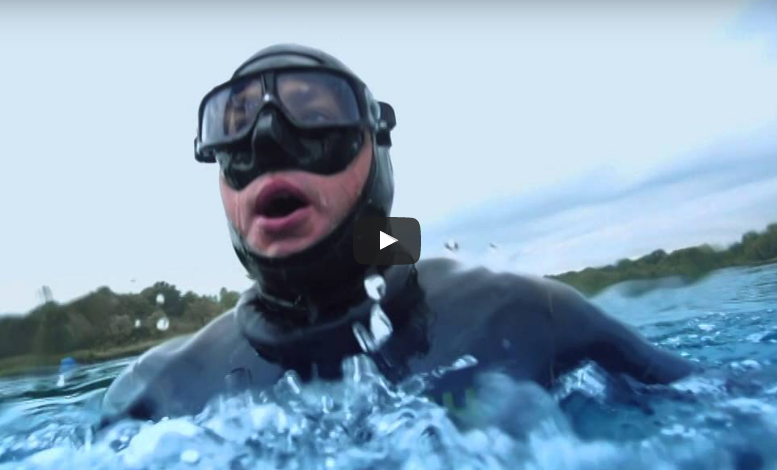 The video takes you on a journey on what it is like to dive deep while holding your breath. Philippe Beauchamp is an instructor and great at explaining the feelings you have during a dive. If you have never tried freediving I hope this will make you want to come join us or other instructors in a freediving course.